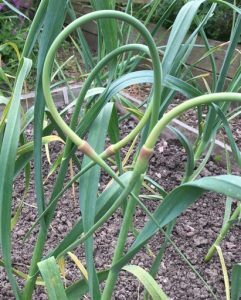 Around mid-June our hardneck garlic sends up scapes – curly stems you can eat. Around the middle of June our hardneck garlic sends up scapes as the bulbs ripen below the soil. Scapes are like flower stems, and they are delicious, only available for a short time each year. They are at their best when they are still curled around. They get tougher later, when they straighten out. There are lots of recipes for garlic scapes on the internet – garlic scape pesto, pickles, stir fry, and lots more. My own favourite way of using them is to saute them for a couple of minutes in hot olive oil and then serve them up fresh with a sprinkle of coarse sea salt. Pick them up and eat them with your fingers!